Energy saving is crucial these days by all means. Energy saved is energy generated. According to The Energy Statistics 2013 of India’s National Statistical Organization (NSO), electricity accounted for more than 57 per cent of the total energy consumption during 2011-12 in India, and building sector is already consuming close to 40 per cent of the electricity. This is expected to increase to 76 per cent by 2040. Today, where commercial building developers grapple with growing pressure to reduce energy consumption and increase operational efficiency, incorporating IoT is extremely significant. Internet of Things plays an important role in Energy Saving. One of the areas is building automation and controlling. Commercial buildings make extensive use of energy every day. Incorporating IoT within devices as HVAC (Heating, ventilation and air conditioning), lighting, safety and security helps improve energy efficiency. Optimal use of energy helps companies make significant cost savings. 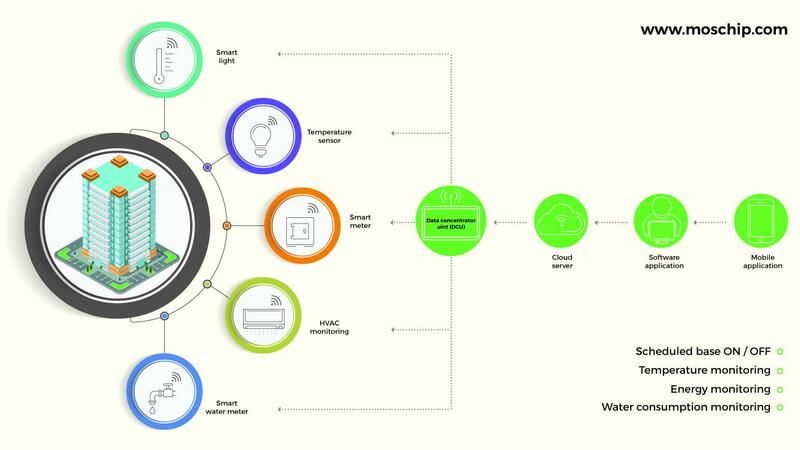 Here, RF based smart devices such as lights, temperature sensors; water meters, energy meters sends the data to centrally placed Data Concentrator Unit (DCU). DCU and RF nodes forms self-forming and self-healing SmarttMesh network. SmarttMesh works on frequency band of 866 – 868 GHz. DCU has backbone of GPRS connectivity to send the data to cloud server. DCU being the heart of the system has inbuilt intelligence for storing the configuration and schedules of RF nodes so as to control these RF nodes. DCU can store this data offline in local storage such as SD card. All the data sent to the cloud server can be used for further analysis to take decisions and influence outcomes. Applications of IoT in this area can take various forms right from the automation and scheduling of floor lights, DG sets monitoring, to fire and safety systems controlling. Lighting automation: Floor lights can be controlled and scheduled for the working days of the week. Lights can be scheduled for the weekend meetings in the offices. Smart phone applications can make to integrate with the supported gateways so as to control the floor lights even from outside. Air conditioning controlling: ACs on different floors can also be controlled or scheduled as per working hours by integrating temperature sensors. Water consumption of each floors: We can monitor the water consumption of each floor by the analysis of water meters readings. We can identify the floors which are having over usages of water than expected. Signage boards: Signage boards outside the buildings can be scheduled to turn off automatically in the morning or make them dimmable after midnight. Basement parking lights controlling: Many commercial buildings have large basement parking space. Parking lights can be scheduled as per the working hours. Or after midnight they can be switched on based on motion at the parking entrance and switch off on motion at the exit. DG set monitoring: DG sets can be monitored to track their usages. We can keep track of the fuel thefts. Alerts like Low fuel can be generated to avoid possible failure of DG backups. Tracking of maintenance if DG sets are consuming high fuel. With MosChip’s SmarttMesh technology with the connected devices, we can not only deliver energy savings but also contribute in productivity gains in all types of commercial buildings, including retail stores, factories, and corporate office spaces. The solution gives building administrators end-to-end flexibility and keeps structure alterations to a bare minimum. To know more about our solutions Contact Us.